Our G2 1.5” Ball Adaptor lets you build a rugged mounting platform with our range of Phone & Tablet Mounts, Tallon RAM Adaptors and RAM Mounts. 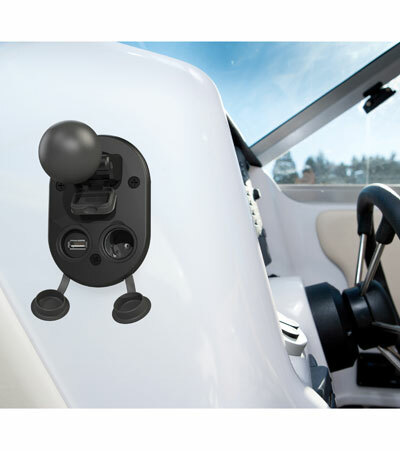 Accessory mount can take straight pull-out loads of up to 600kgs - so as strong as your coaming, gunnel or dash! Excellent product to mount on JETSKI's with limited amount of space, mounted the elite socket on the glove box cover of my 2006 Kawasaki STX-15F and currently using a Garmin 441s chartplotter/sounder on the mount. I had to slightly modified two of the small connection ports which I had to use for my power cord and sonar unit other than that it's a solid mount for any type of applications with jet ski's! I troll and botton fish with my jetski in the rough waters of Kauai, Hawaii so it gets pretty rough out here!! We recently purchased two Tallon RAM Universal X-Grip holders for smartphones and Elite USB Sockets... They really are awesome. We supplied one to a client of ours and he loves it. The other one we fitted to our new Force "work" boat... and everybody here has commented on how practical it is and easy to use.